On The Edge Canada (OTE), Canadian distributors of high end brands such as Pivot Cycles, Enve Composites and Rotor Component, is announcing an exciting new partnership with the highly respected manufacturer Chris King Precision Components (CKPC) from Portland, OR. 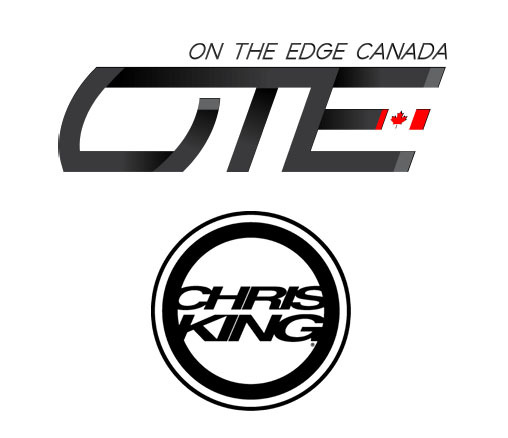 Commenting on the agreement, Denis Lapierre, Sales Manager at OTE said "We are delighted to be partnering with Chris King for the Canadian market and offer an additional channel for their products. We've been building our ENVE rims on CKPC hubs for 10 years and we always wanted to see this brand grow because of the quality and craftsmanship of their products." "When the opportunity came, everyone in the office was stoked. Few brands have built themselves a reputation as strong as Chris King Precision Component. It is with great respect to their accomplishment and heritage that we are happy to distribute their product in Canada starting today [August 3rd]. This addition further establishes OTE Canada as a premium wheel resource for Canadian IBDs." On The Edge (OTE) Canada has been the exclusive Canadian distributor for Pivot Cycles and Enve Composites for the last 9 years and Rotor Components for 2 years. OTE is committed to high end bike products and is working with the best retailers in Canada with excellence in mind. With an annual steady growth since its opening and a successful record of top brands distribution, OTE continues to move forward with today's new partnership. Chris King Precision Components is a performance bicycle component manufacturer based in Portland, OR. Since 1976 we have been domestically producing bicycle parts of the highest quality. We have a disciplined approach to manufacturing which includes rigorous quality control and highly developed production protocols that inform each component that leaves our facility. We understand that to maintain the level of quality we require each and every aspect of our products has to be held to the highest standard. We choose to source our raw materials from domestic mills because of the consistent quality and integrity of production that they offer which cannot be found anywhere else. Throughout our production history we have made the choice to enact environmentally sound manufacturing practices and have worked to apply eco-friendly principals to every part of our business. Consumers recognize our dedication to the value of quality and we have seen the consistent growth in demand for our products in both domestic and international markets.